It seems like nearly everybody's in a hurry these days, running around in this fast-paced world. But here's an old-timer who's unapologetic about his love of taking it slow. Deputy Bryan Bowman, of Florida's Marion County Sheriff's Office, was on patrol over the weekend when he encountered this large tortoise moseying along at a very leisurely pace. Normally, this would be no problem at all, of course — but this particular fellow had chosen to do so in the middle of a road. Bowman reportedly tried to usher the tortoise off the street, but the "grandpa" snapped at him. Here's a video the deputy took after that bit of unpleasantness. Bowman's little rant was done in jest, of course. 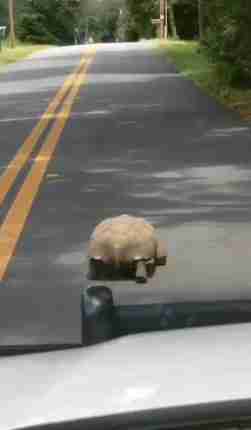 The slow-speed pursuit was actually saving the tortoise's life by protecting him from faster-moving traffic. (It's unclear what species he was exactly, but Florida is home to gopher tortoises, which are a protected species.) And in the end, it all paid off. "Deputy Bowman then just followed the old man for about 20 minutes until he finally went into the woods," the sheriff's office wrote online. "Thanks to Deputy Bowman for catching this wild encounter on tape and for sharing it with us!!"